Title of the work: Estudios Concretos (2017). Instrument and electronics: guitar and electronics (quadriphonic or stereo system diffusion). Commission: Pablo Márquez, 2017, in collaboration with the Elektronisches Studio Basel. World premiere: Basel, Switzerland, 18.05.2017, Pablo Márquez, guitar, Elektronisches Studio Basel (José Javier Navarro, electronics), concierto “Nachtstrom 85”, Gare du Nord, Basel, Switzerland. Concert program (Elektronisches Studio Basel activities register). The three “Estudios Concretos” (Concrete Etudes) were composed from a commission by the extraordinary guitarist Pablo Márquez. I started working on them in 2007 and are the result of a collaboration with him who started in 2005 with "Espira I, EspiraII", for guitar, violin, violoncello and piano. 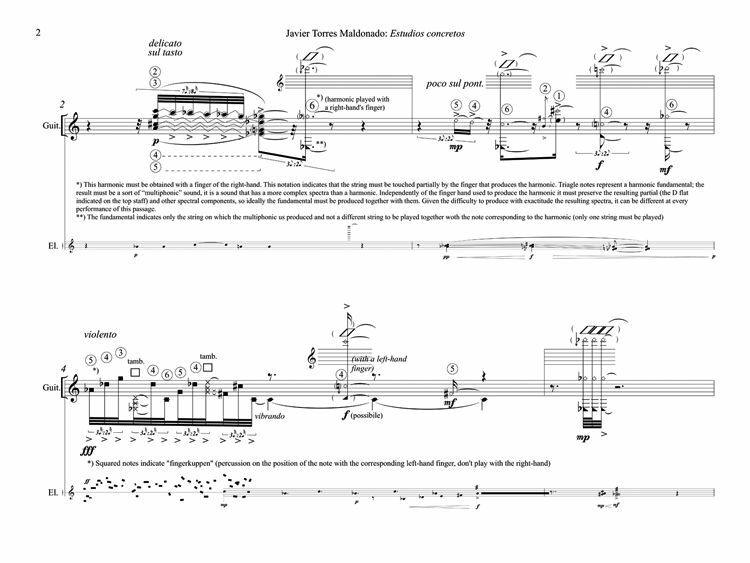 The idea underlying these pieces, especially with regard to the first two studies, is to create concrete music whose sound objects and compositional processes are largely the result of a global association of both sound sources (sounds from reality and those produced by the guitar): a kind of concrete music expanded to the sounds produced by the instrument. In the first study, "Objets intrus” (Intruding objects”), I explored different techniques and association levels of the sonic objects used (spectral or figural fusion, gestural complementarity, spectral distribution ...) The use of a girl voice (the voice of my daughter when she began to sing in the children’s choir of La Scala) is presented as one of the sound objects to which, at a perceptive level, it is possible to associate a different meaning from the rest of the resulting events, arriving to "dissociate" from them. The formal organization corresponds to five short approaches to the base materials: figures that imitate voice inflections, microcosmic fragmentation by granular synthesis, vortex of irregular rhythmic impulses, microcosmic material augmentation obtained by granular synthesis which includes, by figural association or Gesture dissociation, new sound objects ("intruding objects": birdsong, a whip in the air, crystals and other materials clashing ...) The piece is concluded presenting the idea of microcosmic fragmentation but this time constantly altering the speed of reading so that an ascending glissando occurs. The second etude - Crisscrossing ("the bells") - presents metallic and percussive sound objects to the particular sound of two crossed strings (fourth and fifth) and percussion techniques on guitar, as well as other modes of attack production Produced with the right hand. It is a brief study, built from simple elements. The second study - "Crisscrossing" ("the bells") associates metallic and percussive objects with the particular sound of two crossed strings (fourth and fifth) and percussion techniques on the guitar, as well as other forms of production of attacks produced with the right hand. It is a brief study, built from simple elements. In the third study ("Aquatic") water sounds are associated with objects of different sonority. The guitar overlaps with these materials combining the resonance of unisons in double strings, often obtained by harmonics, and more traditional instrumental figures with respect to the previous studies. In the second part of this etude, the idea of augmented microcosmic surfaces already present in the first study is resumed and includes sounds of some musical instruments. The whole concludes with the unmistakable sound of a large bubble of water.